. WKD - weaving and dyeing - New Year Kigo .
. Sakiori 裂き織り/ 裂織 weaving with old cloth stripes - Introduction .
. joofu 上布 Jofu ramie hemp cloth fabric .
. Kimono 着物 Japanese traditional dress . 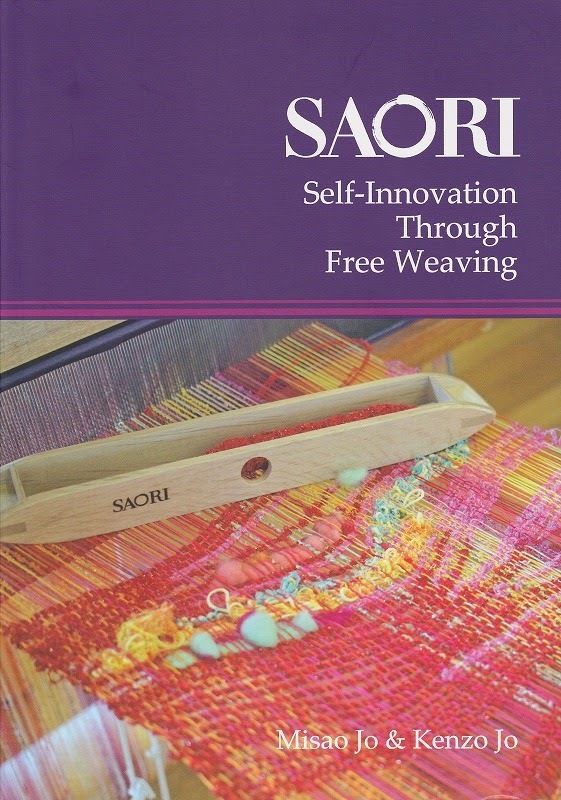 SAORI®, the free-style hand weaving program for everyone! SAORI was founded in 1968 by Misao Jo, a Japanese woman. Today, it is practiced in more than 40 countries.
. Bingata 紅型 from Okinawa . 1. Produced in Aramachi Moka City, Mashikomachi Hagagun, Tochigi Prefecture. Cotton fabric, hand woven with hand spun threads and dyed with indigo in the traditional way of "Moka Momen." Two kinds: striped fabric with pre-dyed threads and stencil dyed with indigo. Other colors than indigo are dyed with plant dyes such as "Benibana"(safflower), "Akane"(Rubia akane),"Shikon"(Rithospermum erythrorhyzon) and "Suo"(Caesalpinia sappan). Everyday clothing, table cloths, "Noren"( shop curtains). As cotton was widely planted in Mashiko-Moka area, cotton fabrics were woven in the late Edo Period and marketed as "Moka Momen"(Moka cotten). It was the representative white cotton fabric of the Edo Period. Moka was the center for trading cotton in this area, thus "Moka Cotton. "They were delicate and silk like fabrics as cotton was hand spun and hand woven with the influence of "Yuki Tsumugi" pongee produced in Yuki, which is located near Moka. 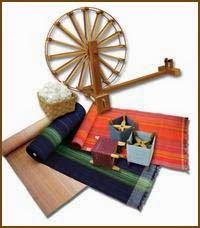 Special spinning wheels were used for producing thin hand spun threads. The production reached its height in the late Edo Period. However, it decreased drastically in the Meiji Period when machine spun cotton was imported and the Nagoya area began producing cotton fabrics. In the early Showa Period there was no production. An association for the maintenance and development of the Moka Momen started in 1986 reviving the tradition with full cooperation of local citizens. "Mashiko Momen" was originated by Hiroshi Higeta, a dyer who inherited 200 years of tradition, in 1960 with the aim of maintaining the tradition of Moka Cotton and indigo dyeing. "Oka Momen" which is used today for summer dishabille, is machine woven cotton, resembling Moka Momen. The indigo used for dyeing is the one produced here or in Awa (Tokushima Prefecture) and lime is added for deoxidizing the water insoluble indigo ball into water soluble. 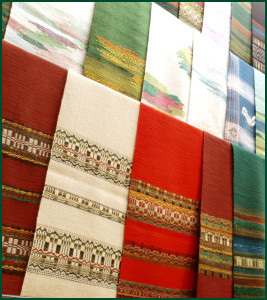 There are five Tama Ori woven fabrics: omeshi-ori, tsumugi-ori, fuutsu-ori, kawaritsuzure-ori and mojiri-ori. is characterized by fine wrinkle patterns known as shibo on its surface. has a unique texture defined by subtle convex-concave patterns. 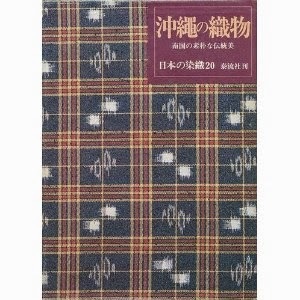 (reversible-figured double weave), which is a type of double-woven fabric (niju-ori), has two layers that display patterns. The main pattern color on the front side becomes the background color on the back, resulting in a unique reversible pattern structure. 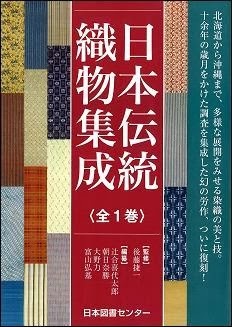 Silk threads that have been either dyed 先染め (sakizome) or degummed 先練り (sakineri) in advance are woven using a Jacquard loom or dobby loom. is a modified form of satin weave. 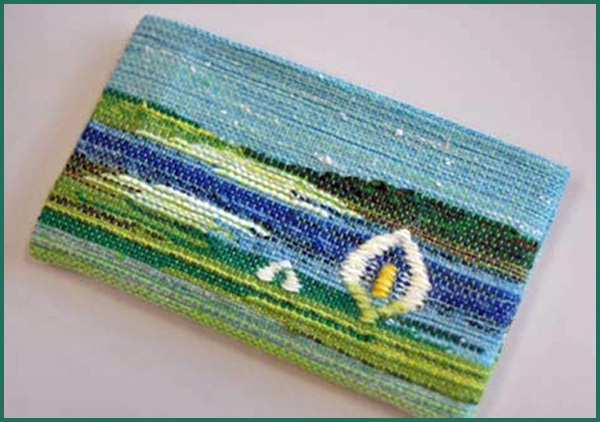 Multicolored weft threads (traverse threads) are used to weave complex, picture-like patterns. 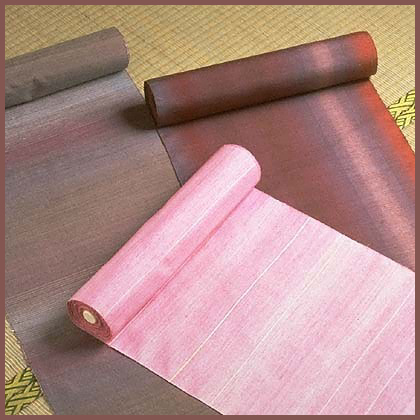 Pre-dyed (sakizome) silk threads are used, and the weave structure is a plain weave or variation of a plain weave. with loosely twisted threads in which the warp threads (longitudinal threads) are intertwined with one another and the weft threads (transverse threads) are then drawn through the weave. This results in gaps between each row of threads. It has a transparent quality similar to that of lace fabric. 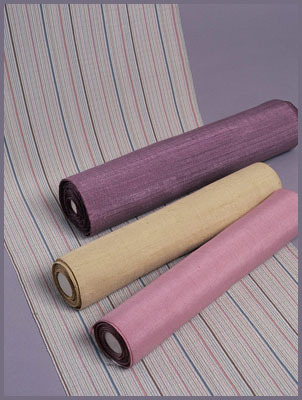 Silk threads that have been either dyed (sakizome) or degummed (sakineri) in advance are woven using a Jacquard loom. These words are from a poem sung during the Tensho Era (1573-1592). They describe the bustling activity of the castle town marketplace at 八王子 Hachioji. In Hachioji, which was known as the "City of Mulberries," sericulture (the raising of silkworms) and textile manufacturing have both long flourished; and these factors have contributed to the continued weaving of various textiles in the area. 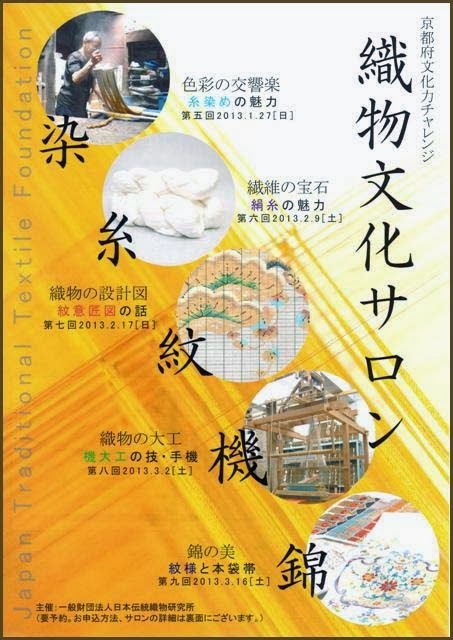 Although the five different fabric types - omeshi-ori, tsumugi-ori, fuutsu-ori, kawaritsuzure-ori and mojiri-ori - are referred to collectively as Tama Ori today, they can all be considered the culmination of developments during Hachioji's long textiles history. 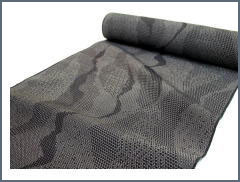 Leading weaving industries developed in locations with clean water, with famous production areas including the Kamo River in Kyoto and the Watarase River in Kiryu and Ashikaga. Hachioji, the home of Tama Ori weaving, is no exception to this rule. The city is surrounded by the Aki and Asa Rivers, which have headwaters within the borders of the former Bushu (Musashi), Soshu (Sagami) and Koshu (Kai) Provinces. The history of weaving in Hachioji has close ties with the waters of these rivers. Hachioji's markets were formerly held on the fourth and eighth day of each month. After the Tokugawa (who later became the rulers of Japan) relocated to the Kanto area, it is believed that Hachioji's Yokoyama and Yokaichi Markets began to serve as important commercial venues for the textiles that became important local products. Hachioji was situated at the borders of Bushu and Koshu Provinces, making it a strategically important location in military terms. 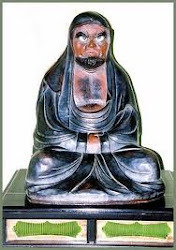 The Kanto head magistrate's office and junior officials (Sennin Doshin) were located in the city, and Hachioji served as the protector of the western part of Edo. These developments elevated the status of Hachioji. The Tama Ori production process is distinctive in terms of the division of labor. The singular, quiet elegance of the woven fabrics results from the separation and specialization of production processes. Such processes include textile manufacturing, preparing punched cards (jacquard cards) for guiding looms, thread dyeing, gluing, warping (preparing reels to determine the spacing and placement of longitudinal threads), preparing kasuri (the weaving in of dyed fibers to create patterns and images), print-style dyeing, thread twisting, setting of loom frameworks, and the final treatment of cloth (fine adjustments made to improve its texture).